H. Rick Bamman - hbamman@shawmedia.com Marian Central's Janelle Allen shoots over Crystal Lake Central's Maddie Hollander in the second quarter during the Bill Knox Thanksgiving Invite on Wednesday, Nov. 15, 2017 at Harvest Christian Academy in Elgin. 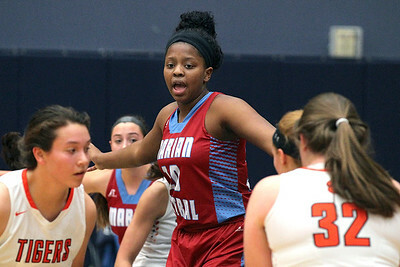 H. Rick Bamman - hbamman@shawmedia.com Marian Central's Janelle Allen defends in the paint in the first quarter against Crystal Lake Central in the Bill Knox Thanksgiving Invite on Wednesday, Nov. 15, 2017 at Harvest Christian Academy in Elgin. 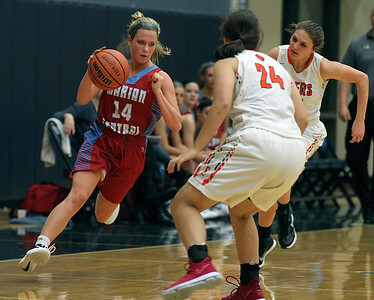 H. Rick Bamman - hbamman@shawmedia.com Marian Central's Ragan Dineen (left) drives between Crystal Lake Central defenders Maddie Haslow (center) and Tara Ernd in the second quarter during the Bill Knox Thanksgiving Invite on Wednesday, Nov. 15, 2017 at Harvest Christian Academy in Elgin. 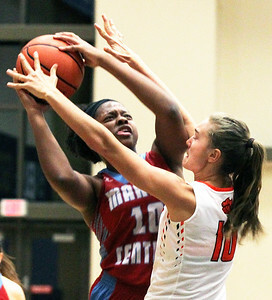 H. Rick Bamman - hbamman@shawmedia.com Marian Central's Vannessa Garrelts goes in for a lay-up past Crystal Lake Central's Elise Olson in the second quarter during the Bill Knox Thanksgiving Invite on Wednesday, Nov. 15, 2017 at Harvest Christian Academy in Elgin. 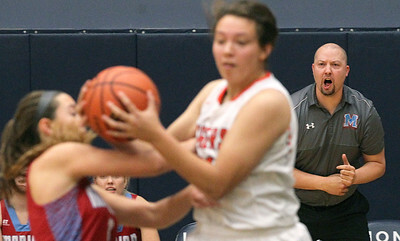 H. Rick Bamman - hbamman@shawmedia.com Marian Central head coach Tony Powe reacts to the action on the court against Crystal Lake Central in the Bill Knox Thanksgiving Invite on Wednesday, Nov. 15, 2017 at Harvest Christian Academy in Elgin. 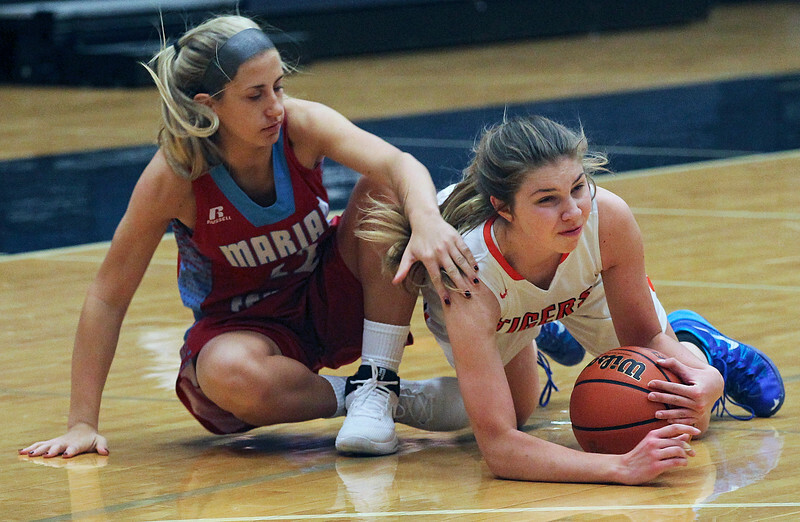 H. Rick Bamman - hbamman@shawmedia.com Marian Central's Maria Mercurio (left) and played Crystal Lake Central's Megan Wozniak scramble for a loose ball in the first quarter during the Bill Knox Thanksgiving Invite on Wednesday, Nov. 15, 2017 at Harvest Christian Academy in Elgin. 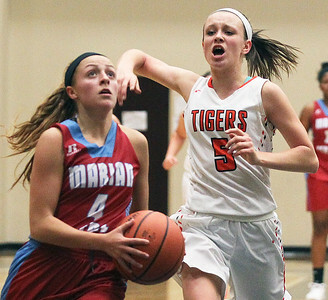 H. Rick Bamman - hbamman@shawmedia.com Crystal Lake Central's Maddie Haslow passes to a teammate between Marian Central defenders Amber Reynolds (23) and Mia Awe in the first quarter during the Bill Knox Thanksgiving Invite on Wednesday, Nov. 15, 2017 at Harvest Christian Academy in Elgin. 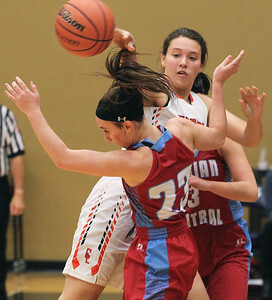 Marian Central's Maria Mercurio (left) and played Crystal Lake Central's Megan Wozniak scramble for a loose ball in the first quarter during the Bill Knox Thanksgiving Invite on Wednesday, Nov. 15, 2017 at Harvest Christian Academy in Elgin.